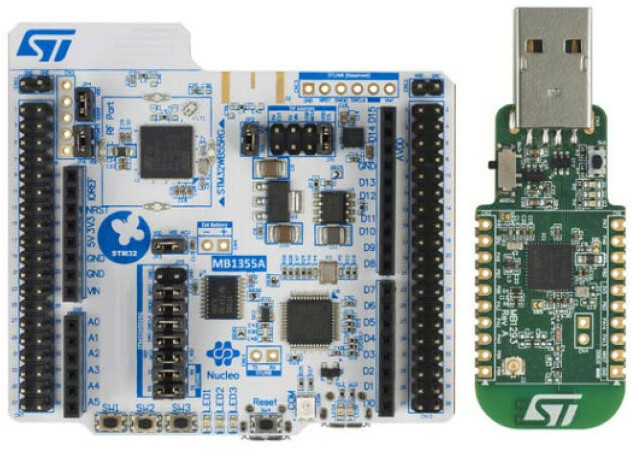 STMicro has announced yet another family part of their STM32 portfolio with STM32WB micro-controller family featuring an Arm Cortex M4 application core, a Cortex M0+ core to offload the main core of networking tasks, as well as Bluetooth 5 and 802.15.4 radios. The MCU’s 802.15.5 radio can run other wireless protocols concurrently, including OpenThread, ZigBee, or proprietary protocols used to connect devices to the Internet of Things (IoT). 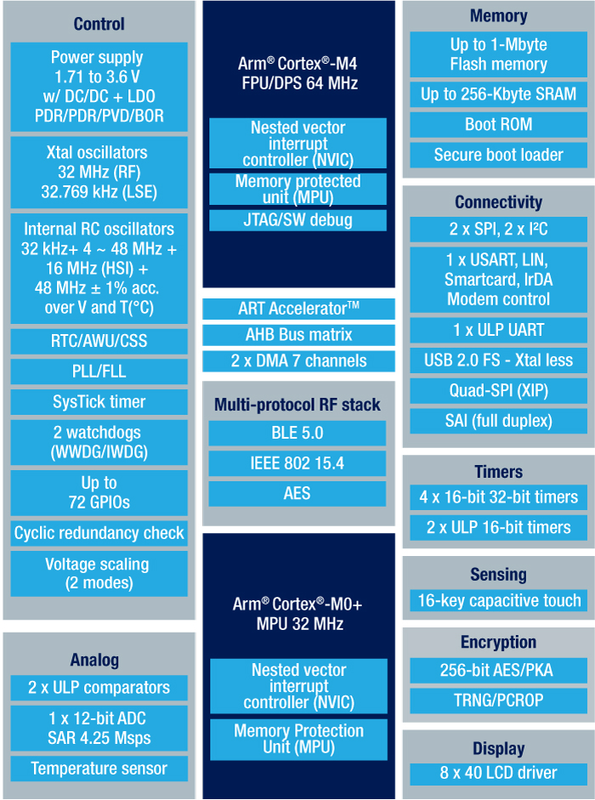 The boot loader supporting support USART, SPI, I2C and USB interfaces, and OTA (Over the Air) update for Bluetooth Low Energy and 802.15.4 are possible. Nine SKUs are now available with variation in the amount of flash / RAM, and package size as shown in the chart above. The company provides STM32CubeMonitor-RF for radio testing, STM32CubeMX pinout/clock configurator and code generator, as well as peripheral drivers, middleware, code examples, and a dedicated STM32 Nucleo (MB135SA) board / evaluation pack to start with the platform. STM32WB engineering samples will be provided to lead customers in Q1 2018, with pricing starting at $1.56 for high-volume orders. More information can be found in the product page, and press presentation document (PDF).